This entry was posted in 093) 2018 Shuttlecraft Decoupage, 2018, Decoupage, Galileo, Hallmark News, Ships, ST: TOS (TV) on November 26, 2018 by garfieldandtrump. This entry was posted in 092) 2018 Spock Decoupage, 2018, Characters, Decoupage, Hallmark News, Spock, ST: TOS (TV) on November 26, 2018 by garfieldandtrump. This entry was posted in 091) 2018 Kirk, 2018, Characters, Kirk, ST: TOS (TV) on October 7, 2018 by garfieldandtrump. According to intergalactic trader Cyrano Jones, there is only one love that money can buy: a tribble. Add this ball of fuzzy love to your Christmas tree to keep away Klingons or simply to bring memories of the classic episode “The Trouble With Tribbles” from the Star Trek original television series. Squeeze this plush fabric Christmas tree ornament to see it vibrate and coo (battery-operated). 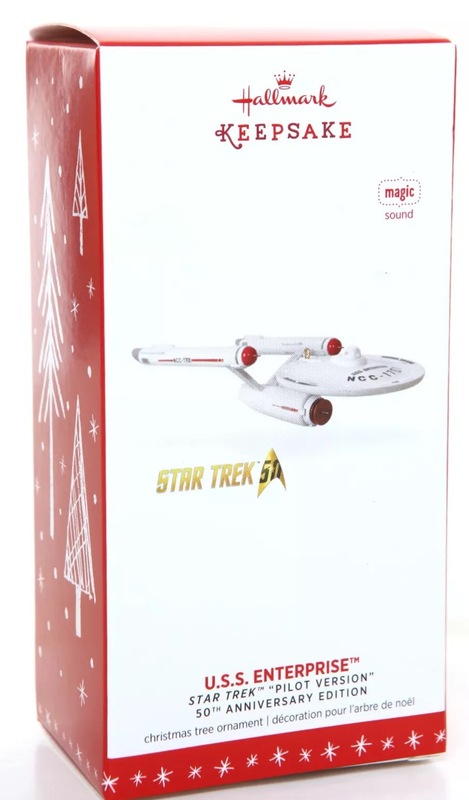 * Magic Sound and Motion Christmas tree ornament. Touch the ornament to feel it move and hear its soothing sounds. Battery operated. Requires three (3) LR44 batteries, included. * This fabric Christmas tree ornament comes pre-packaged in a box for easy gift giving, preservation and storage. Dated 2019 in copyright. * Fabric Christmas tree ornament is lead-free and measures 4.5″ W x 3.38″ H x 3.38″ D.
Tribble from Star Trek: The Original Series’ The Trouble with Tribbles. This entry was posted in 096) 2019 Tribble, 2019, Plush, ST: TOS (TV), Tribble on August 2, 2018 by garfieldandtrump. 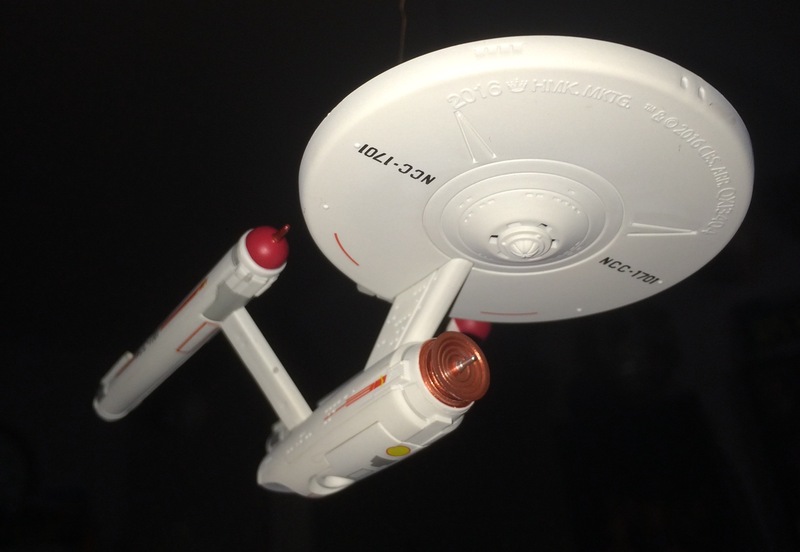 This entry was posted in 090) 2018 Enterprise-Metal, 2018, Die-cast, Ent. 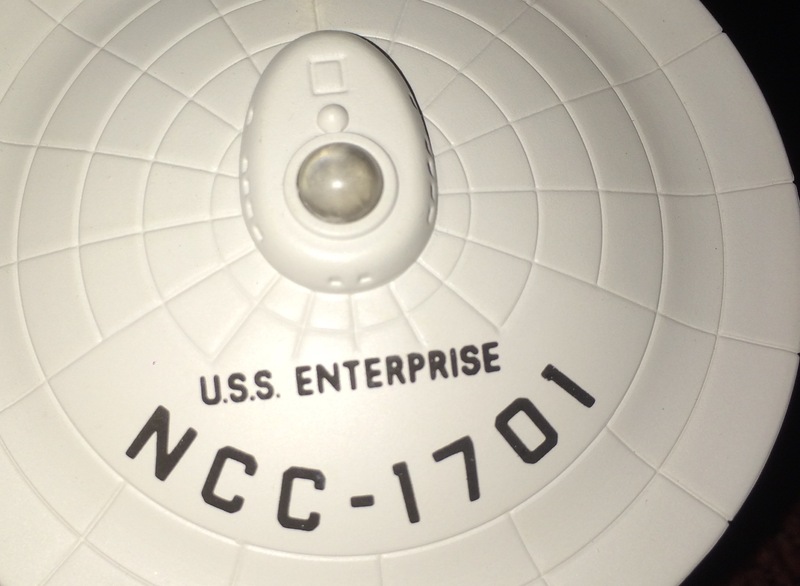 NCC-1701, Ships, ST: TOS (TV) on April 17, 2018 by garfieldandtrump. This entry was posted in 088) 2018 Tricoder, 2018, Battery, Ornaments by Era, Ornaments by Pwr Source, Ornaments by Theme, Ornaments by Year, Props, ST: TOS (TV) on October 5, 2017 by garfieldandtrump. 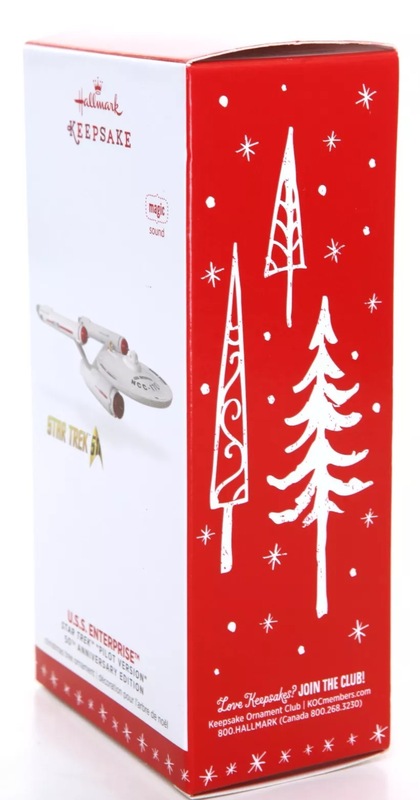 2017 Hallmark Christmas tree ornament featuring a likeness of Mr. Spock from Star Trek – The Original Series. This ornament is made out of resin and comes with a ribbon attached for hanging. This is not sold in Hallmark stores but is a Wal-Mart exclusive. This is not a Hallmark Keepsake ornament but a Hallmark branded ornament similar to 2016’s Maxine ornament. This entry was posted in 085) 2017 Spock, 2017, Characters, Hallmark News, Spock, ST: TOS (TV), Uncredited on September 7, 2017 by garfieldandtrump. 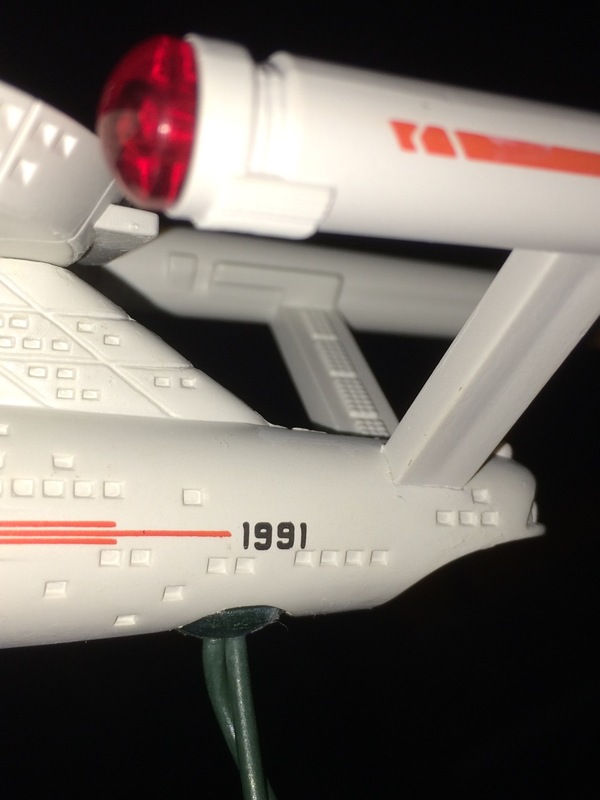 It has been 25 years since Star Trek’s Enterprise debuted as a Hallmark Keepsake Ornament. Over that quarter of a century it has been followed by nearly eighty more ornaments depicting ships, characters and scenes from all five television shows and three movies series. We have Lynn Norton to thank for sculpting all of the ship ornaments but 1992’s Galileo. This entry was posted in 001) 1991 Enterprise, 1991, Ent. 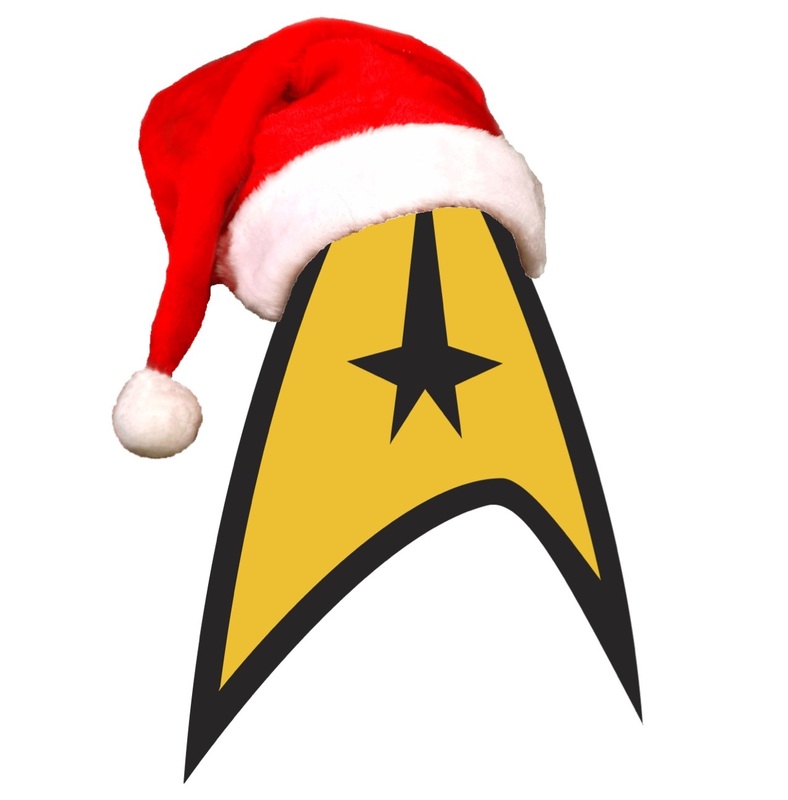 NCC-1701, Lynn Norton, Master List, Ornaments by Artist, Ornaments by Era, Ornaments by Ships, Ornaments by Theme, Ornaments by Year, Ships, ST: TOS (TV) on May 22, 2016 by garfieldandtrump. U.S.S. 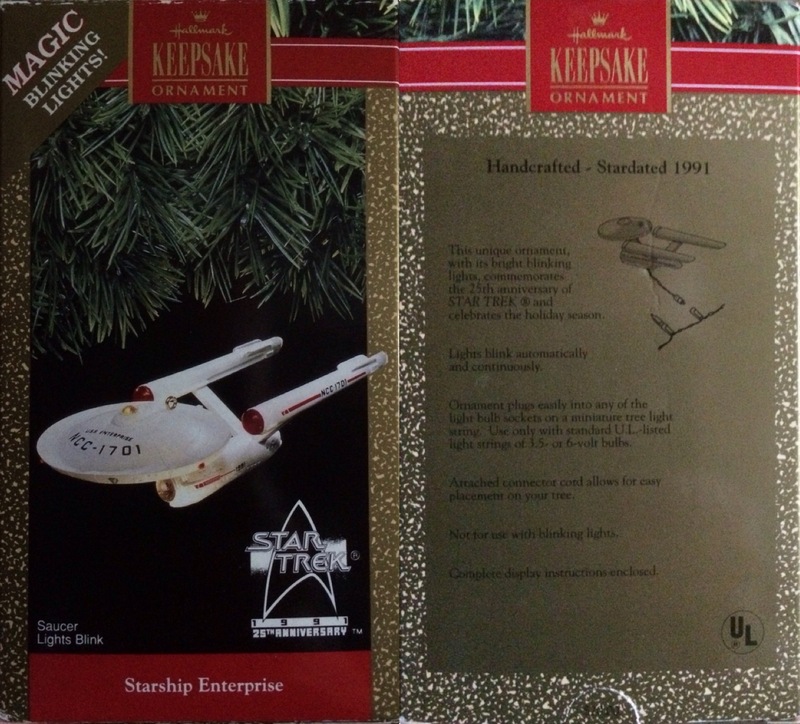 Enterprise – Featuring dialogue and music directly from the original “Star Trek” TV Series, this Keepsake Ornament depicts the iconic starship as originally built and painted for special-effects filming. 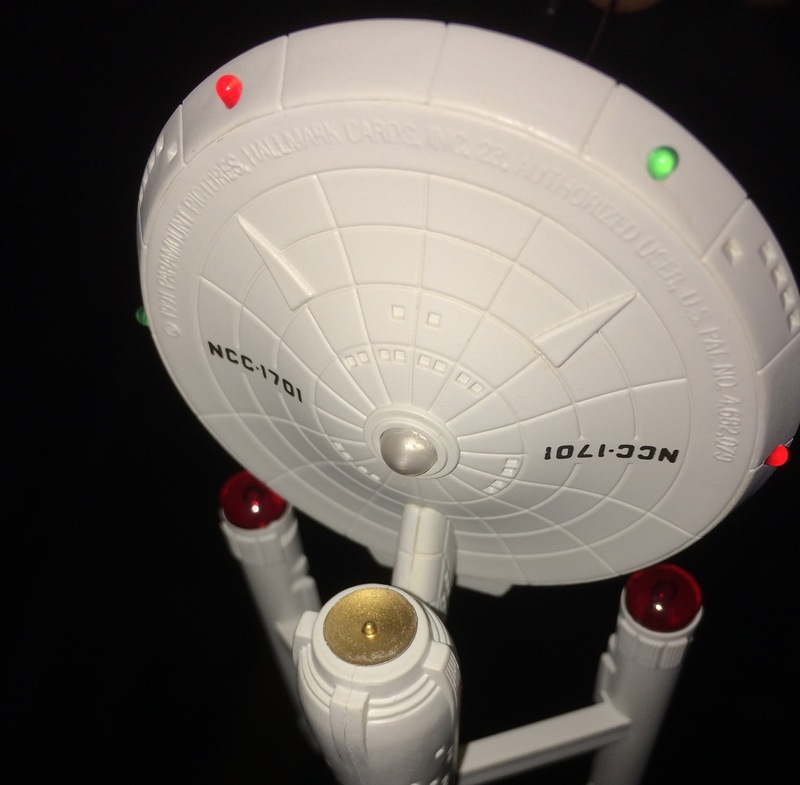 This is a repaint of a 2016 Keepsake Ornament celebrating Star Trek’s 50th anniversary. 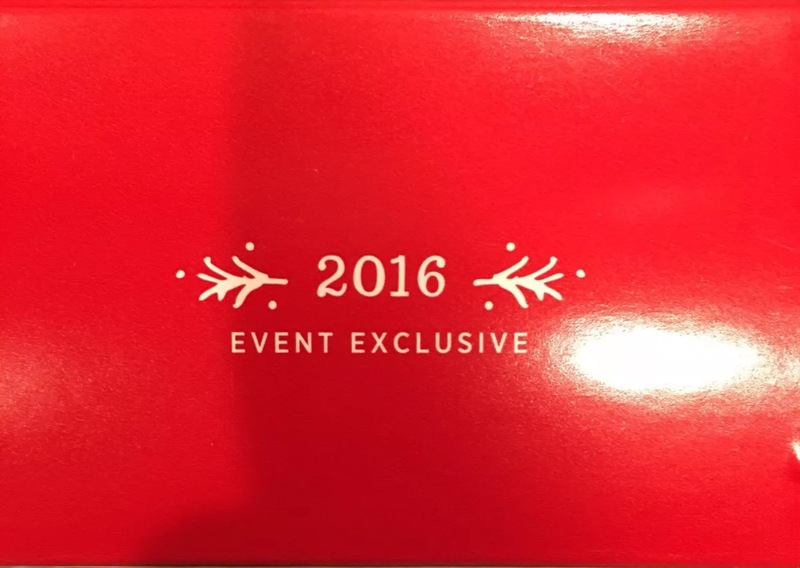 Limited quantity of 3,450. Lynn Norton…“This is the one that I really went out of my way to make as accurate as possible. 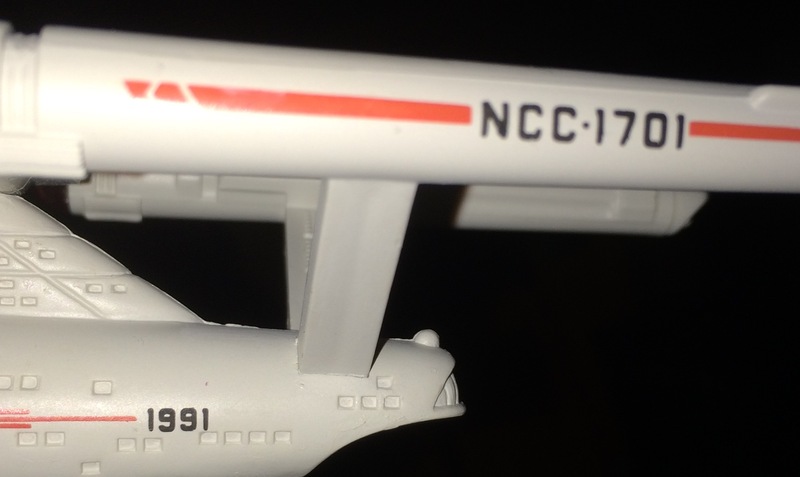 I based it on the original shooting model with its larger bridge dome, larger deflector dish and nacelle features as a tribute to the series’ 50th anniversary. Assuming it’s able to maintain all of its details in final production, it’s more accurate than anything I’ve done before. 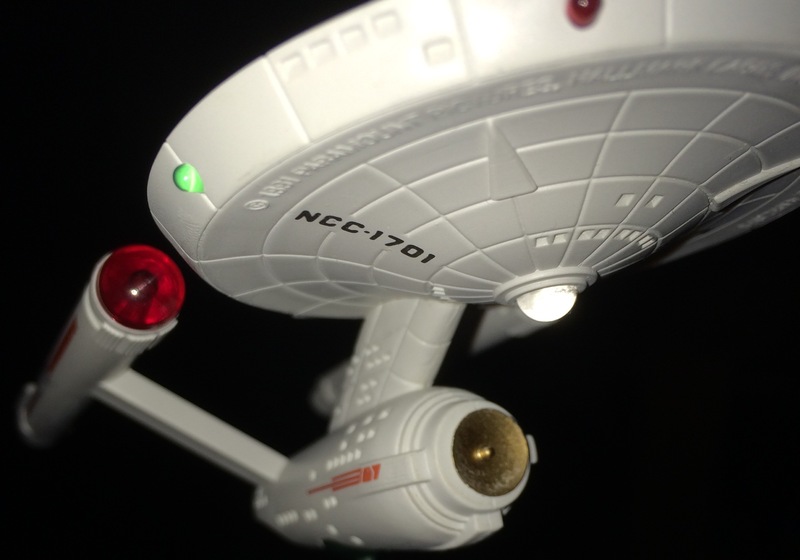 This entry was posted in 080) 2016 Enterprise/Pilot, 2016, Battery, Ent. 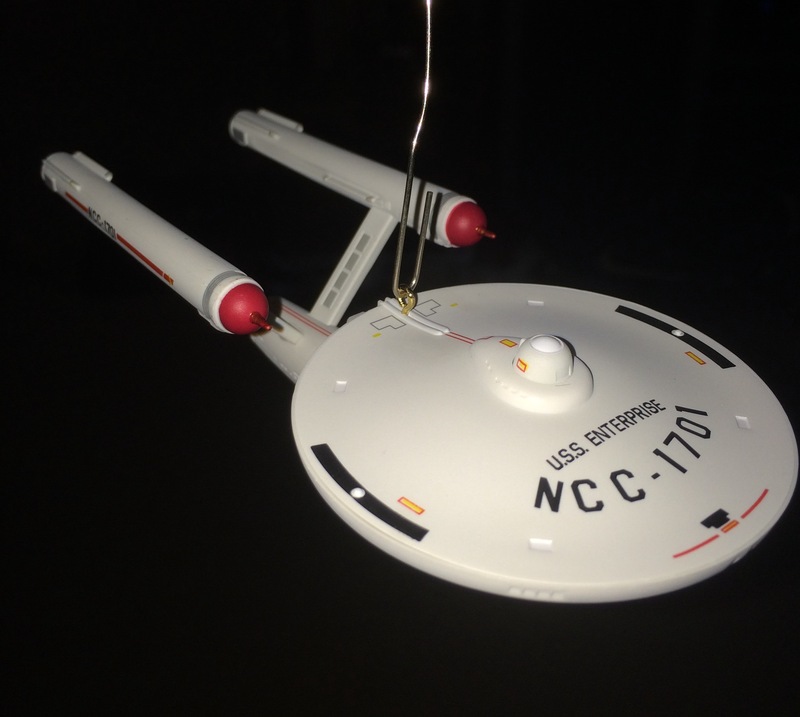 NCC-1701, Lynn Norton, Magic Series, Magic Sound, Master List, Ornaments by Artist, Ornaments by Era, Ornaments by Pwr Source, Ornaments by Series, Ornaments by Ships, Ornaments by Theme, Ornaments by Year, Ships, Special Event Editions, ST: TOS (TV) on April 11, 2016 by garfieldandtrump. To commemorate the 50th anniversary of Star Trek™, we’ve set our phasers to “fun” with this collector’s set of itty bittys®. Captain Kirk, Spock, Lieutenant Uhura and Doctor McCoy are right at home in their box, which is designed to resemble the command bridge on Starship Enterprise™. Adventures are way more fun when you have your friends with you! 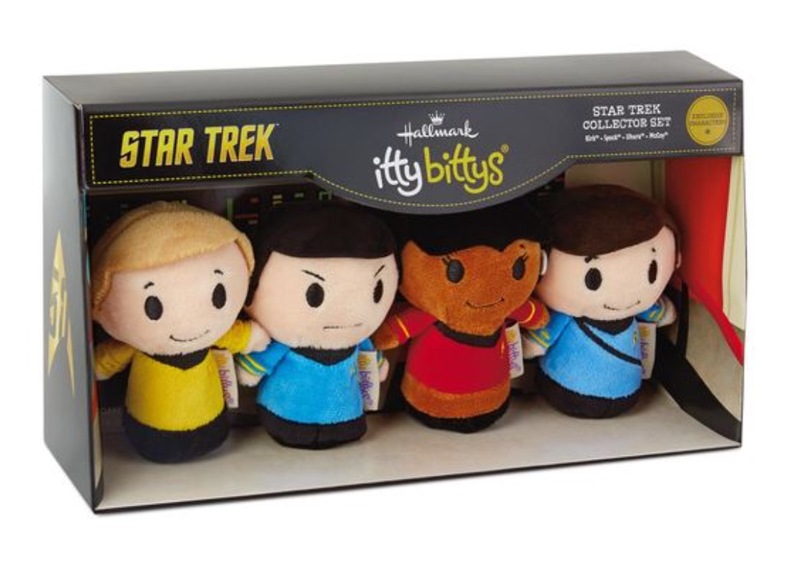 The itty bittys crew of the U.S.S. Enterprise is on a mission to explore new worlds, seek out new life and boldly go where no one has gone before. James T. Kirk™ is the brash, daring captain of the starship Enterprise. He’s the leader and the heart of the crew. Spock™, science officer and first officer, is the logical Vulcan who keeps the crew on track and grounded. Nyota Uhura™, chief communications officer of the Enterprise, is a brave and talented technician. Leonard “Bones” McCoy™, hot-headed chief medical officer, is a loyal friend who keeps the crew healthy. This entry was posted in 2016, Characters, Hallmark Itty Bittys, Hallmark Non-Ornaments, Ornaments by Era, Ornaments by Material, Ornaments by Theme, Ornaments by Year, Plush, ST: TOS (TV) on July 9, 2015 by garfieldandtrump.